I could live on pasta! It’s one of my favorite foods, though I try to limit it because…CARBS. This summer I was introduced to Academia Barilla (yes, related to the blue box of Barilla you know!) and fell in love with pasta all over again. This is restaurant quality pasta so it’s got more ‘bite’ to it, and the thing that’s really noticeable to me after I eat it is that I don’t feel like I’m in a carb coma. It has a lower glycemic index making it a better choice for keeping your blood sugar in check. Read on to see what makes Academia Barilla my new favorite pasta, some tips from a real chef on how to cook it, and get a delicious recipe, too! 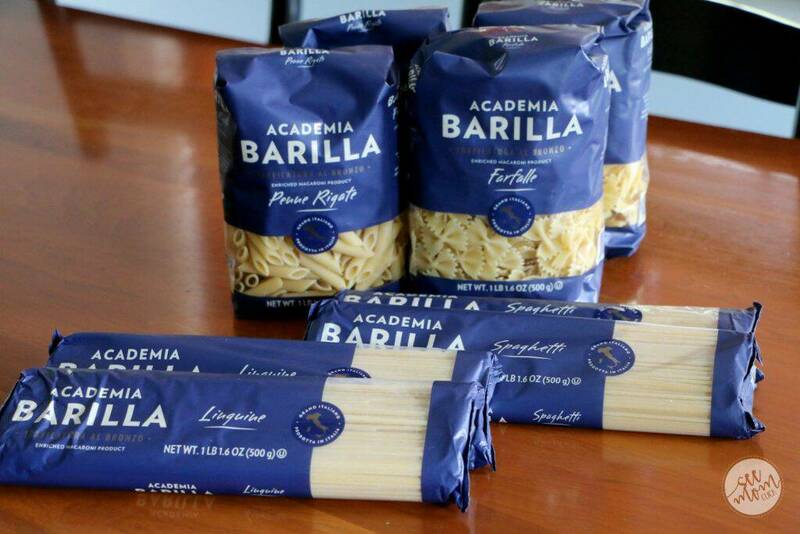 Academia Barilla comes in a few different cuts including linguine, spaghetti, penne, and farfelle. Its thicker texture makes it ideal for serving with sauces. And this pasta can’t be overcooked! How nice is that for those of us multi-tiasking while we’re making dinner? 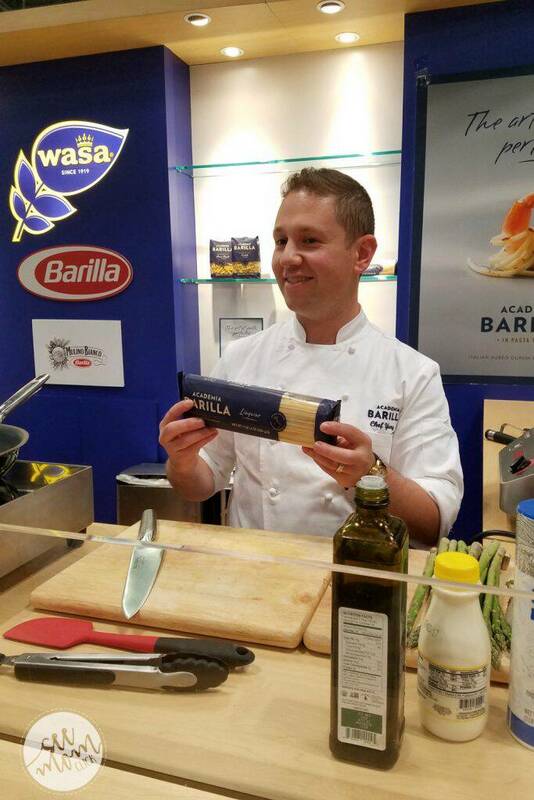 At the Summer Fancy Food Show we were treated to a demo from Barilla’s Chef Yury. The biggest and simplest tip he gave is that when you are cooking pasta, the water should taste like the sea. Do NOT forget to salt your water. He made us this delicious dish, and the presentation is the next tip: When serving long cut pastas like this, give it a twist! Doesn’t it look so fancy? You can easily do this with a large fork and spoon. Throw on some green garnish and voila! Fancy, fancy! And it was also delicious. I couldn’t wait to get home and get cooking with this pasta. As I mentioned, I am a pasta lover but don’t always love how I feel after I eat a bowlful. It is honestly so different with Academia Barilla. I don’t get that I-need-a-nap-pronto feeling that I often feel with other pastas. We love seafood so pairing the linguine with mussels was a perfect dish for my family! There are a few steps here but it’s really not difficult and this is one of those dishes that will impress your company, so serve it when you’re entertaining and wow the crowd! Here's a new one to add to your repertoire of delicious pasta recipes! Linguine With Mussels In Tomato Sauce is fresh and tasty and simple to make. This is a perfect dish to serve when entertaining guests. It's fancy yet easy to put together. Pour can of tomatoes into a food processor and pulse into a sauce, or do it with a hand blender. It doesn't need to be completely smooth. Put a large pot of salted water on the stove to cook the pasta. While you're waiting for that to boil, move on to the next step. Cook the pasta per package directions when the water boils. Crush one of the cloves of garlic. I lay the knife flat on top of it and give it a good whack with the palm of my hand. In a sauce pan that has a lid, add the crushed garlic, the chopped shallot, and white wine. Put the lid on top and let it boil. Once that boils, remove the lid and add the mussels. Replace the lid and let the mussels steam for a couple of minutes. After 2-3 minutes, open the lid and use tongs to remove the mussels that have opened and place them in a large bowl. Replace the lid and give any remaining mussels another couple of minutes to open. If any mussels do NOT open in this time, discard them. Allow the mussels to cool in the bowl while you work on the sauce. Strain what's left in the saucepan through a mesh strainer into a bowl to remove any sediment from the mussels. Wipe the pan out and place it back on the stove to start the sauce. Place olive oil, red pepper flakes, and the remaining 2 cloves of garlic, minced, into the pan. Cook over medium heat for about a minute. Add the tomatoes and thyme. Allow to simmer for 5-10 minutes until the sauce cooks down a little bit, stirring frequently. While the sauce is coming together, prepare the mussels. Remove about half of them from their shells and keep the other half in the shells. Add the liquid you strained from cooking the mussels to the tomato sauce. Stir and bring back to a simmer. Add all of the mussels. Stir to combine. When the pasta is done, drain it and add to the sauce with the mussels. Toss to combine. Garnish with the fresh parsley and serve. Enjoy! This recipe is delicious! We actually felt like we could have used more mussels, so if you have a bigger bag available to you at the seafood market (and you like mussels!) go ahead and grab it. Recipe inspired by Cooking NYTimes. Isn’t it yummy looking? So good. And for the most part this is a one-pot meal, though you have to move different things in and out of the pot a couple of times. We had a bunch left over (it does make a lot – I find this pasta to be pretty filling so you don’t need to eat as much) and it was great heated up as well. Check out the Academia Barilla website for more delicious recipes and be sure to follow on Facebook and Twitter as well! Academia Barilla is generously sponsoring a delicious giveaway for my readers! One of you will win a generous assortment of pasta just like I received! One winner per household, email address, or home address. If you have won this prize on another blog you are ineligible to win again. Winner must have a U.S.-based address and be age 18+ to receive the prize. This giveaway will end at 11:59pm on 11:59pm ET on August 14, 2017. Good luck! I actually would love to make spaghetti and meat balls! Sounds boring, but I love it! I would love to make fettuccine Alfredo with chicken! I love to make chicken Alfredo with this wonderful Pasta! I love to make Shrimp Fetuccini for my Husband! Our family favorite pasta meal is spaghetti with meat sauce. We could eat it several times a week, we love it that much! I would love to make Pasta salad with the bow tie pasta- very festive! I make mine with an oil and vinegar marinade. I would love to make linguine with ham, peas and mushrooms with alfredo. I would make angel hair pasta with pesto and real Regiano Parmesan cheese and plenty of garlic. I would love to make the FUSILLI SALMON AND ASPARAGUS dish found on the Academia Barilla website. I would make spaghetti and meatballs with the prize package. I love to use Farfalle pasta with diced tomatoes, garlic, basil, onions, green olives and capers. I would love to make pesto with Barilla Pasta! I love penne with vodka sauce, I have a great recipe that I got from my mother in law. My favorite is chicken alfredo with linguine. My favorite is a pasta dish with cheese. I like to add broccoli florets and chicken as well. I wouid love to make a nice chicken alfredo. Spaghetti and meat balls , I eat this meal atleast once a week. I would like to make eggplant rigatoni. My favorite pasta dish that I would like to make is my pasta salad. I make it all the time and it’s so good. I also would like to make a lasagna casserole that my family really loves. I would make baked spaghetti with a good sauce. Either cacio e pepe or my dad’s recipe for pasta with mushrooms, broth, garlic, and cheese. So good. I love to make pasta in a tomato, vodka cream pasta with bacon in it. So yummy! My favorite is oven baked macaroni and cheese with that golden brown layer of cheese on top. I think with the thicker pasta i would try artichoke and spinach stuffed chicken breasts over it with creamy light tomato based sauce and freshly grated romano cheese. I’d like to make a pasta puttanesca. I would make grilled chicken Alfredo. I’d love to make Spaghetti Carbonara. I would make Farfalle pasta with red sauce and mushrooms and veggies. Shrimp scampi is our family favorite. I would make Linguine with Shrimp all’Amatriciana. What is your favorite pasta dish that you’d love to make with Academia Barilla pasta? I like elbow or penne noodles to make homemade mac & cheese. My husbands seafood pasta is my favorite. I’d love to make a pasta salad with fresh veggies from the farmer’s market, with walnut oil and raspberry balsamic vinegar. I would love to make farfalle with chicken, onions, spinach, tomato and alfredo sauce. Fettuccine Alfredo. Thanks for the chance to win! I love to make my famous Pasta Bake using Barilla penne pasta. It’s my take on lasagna, and it has become a fan favorite amongst my family, friends and coworkers. My favorite pasta dish is plain old spaghetti and meatballs served with sourdough bread. I’d make chicken and broccoli fettuccine alfredo with this pasta. Thanks. I would love to make Chicken and Broccoli Fettuccine Alfredo for my older son, Spaghetti with marinated tomato and hard ricotta for me!! I would like to make pesto with Barilla Pasta. I WOULD LOVE TO MAKE COLD PASTA SALAD. I whip up a dish called Italian Drunken Noodle. It is a family fave! Cooking is my #1 passion in life and I would be so thrilled to win.